Services and Trading of Exide Batteries and Services. Quality is the prime motto of our organization. We believe in providing best quality range of Batteries, Radiator, and Coolers to our clients. Due to this approach, we are enjoying good position among our clients. We maintain quality standards throughout business activities i.e. from procurement of products from the vendors to the final delivery of the products. We have well maintained quality control system through which we ensure defect free and highly efficient range. Our each and every product is inspected for their efficiency. For providing Flawless range of Batteries, Radiators, and Coolers, we have customer care services that are coupled with schedule delivery of consignments. 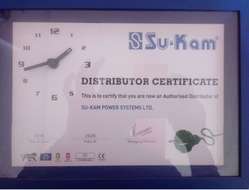 To be one of the leading distributors of batteries and Inverters. To excel as an employer, corporate citizen and more significantly, as a contributor to the betterment of the global environment. And we do it with PASSION. We have comprehensive range of the Batteries, Inverters,UPS, and SMF batteries . The highly experienced team is the backbone of our organization that includes highly experienced professionals who are well versed in their respective departments. Our team work in close coordination with our valued clients that helps us to garner strong foothold in the industry and catering distinct requirements of clients. The team members ready to work hard in the peer work pressure. Our organization believes in providing maximum satisfaction to our clients by providing them superior range of Batteries,. For attaining this, we follow ethical business network that has enabled us to garner strong hold in the market. We have widespread business network that has enabled us to cater huge client base . We are renowned name in wholesaling, retailing and service providing of wide range of Batteries. Ready Stock of the Entire range of Batteries.